Balkan Holidays have been nominated in the category of Best Tour Operator to East and South East Europe at the forthcoming "British Travel Awards". 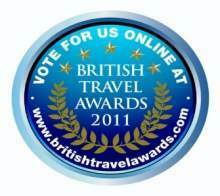 You can register your vote by clicking HERE and ensure that Balkan Holidays claim this award. Balkan Holidays are the specialist tour operator to this region with over 46 years of experience in providing package holidays to Bulgaria, Croatia, Slovenia, Montenegro and Romania. We offer great value for money holidays to this area ranging from Beach and Ski Holidays to City Breaks and Cultural Tours. Balkan Holidays truly are the experts, so register your vote today and ensure that Balkan Holidays are voted Best Tour Operator.